"Fearless Vampire Killers" and "Dance of the Vampires" redirect here. For the band, see Fearless Vampire Killers (band). For the musical, see Dance of the Vampires (musical). The film is set "deep in the heart of Transylvania" and the story appears to take place sometime during the mid-19th century. Professor Abronsius, formerly of the University of Königsberg and his apprentice Alfred are on the hunt for vampires. Abronsius is old and withering and barely able to survive the cold ride through the wintry forests, while Alfred is bumbling and introverted. The two hunters come to a small village seemingly at the end of a long search for signs of vampires. The two stay at a local inn full of angst-ridden townspeople who perform strange rituals to fend off an unseen evil. While staying at the inn, Alfred develops a fondness for Sarah, the overprotected daughter of the tavern keeper Yoine Shagal. Alfred witnesses Sarah being kidnapped by the local vampire lord Count von Krolock. Crazed with grief and armed only with a bunch of garlic, Shagal attempts to rescue her but does not get very far before he is captured, drained of his blood and vampirised. After Shagal rises and attacks Magda, the tavern's beautiful maidservant and the object of his lust when he was still human, Abronsius and Alfred follow his trail in the snow, which leads them to Krolock's ominous castle in the snow-blanketed hills nearby. They break into the castle but are trapped by the Count's hunchbacked servant, Koukol. They are taken to see the Count, who affects an air of aristocratic dignity while questioning Abronsius about why he has come to the castle. They also encounter the Count's son, the foppish (and homosexual) Herbert. Meanwhile, Shagal, no longer caring about his daughter's fate, sets up his plan to turn Magda into his vampire bride. Despite misgivings, Abronsius and Alfred accept the Count's invitation to stay in his ramshackle Gothic castle, where Alfred spends the night fitfully. The next morning, Abronsius plans to find the castle crypt and destroy the Count by staking him in the heart, seemingly forgetting about the fate of Sarah. The crypt is guarded by the hunchback, so after some wandering they attempt to climb in through a roof window. However, Abronsius gets stuck in the aperture, and it falls to Alfred to complete the task of killing the Count in his slumber. At the last moment his nerve fails him and he cannot accomplish the deed. Alfred then has to go back outside to free Abronsius, but on the way he comes upon Sarah having a bath in her room. She seems oblivious to her danger when he pleads for her to come away with him, and informs him that a ball is to take place this very night. After briefly taking his eyes off her, Alfred turns to find Sarah has vanished into thin air. After freeing Abronsius, who is half-frozen, they re-enter the castle. Alfred again seeks Sarah but meets Herbert instead, who first attempts to seduce him, and then, after Alfred realizes that Herbert's reflection does not show up in the mirror, reveals his vampire nature and attempts to bite him. Abronsius and Alfred flee from Herbert through a dark stairway to safety, only to be trapped behind a locked door in a turret. As night is falling, they become horrified witnesses as the graves below open up to reveal a huge number of vampires at the castle, who hibernate and meet once a year only to feast upon any captives the Count has provided for them. The Count appears, mocking them and tells them their fate is sealed. He leaves them to attend the ball, where Sarah will be presented as the next vampire victim. The hunters escape by firing a cannon at the door - substituting steam pressure for gunpowder - and come to the ball in disguise, where, although exposed by their reflections in a huge mirror, they are able to grab Sarah and escape. Fleeing in a horse-drawn sleigh, Abronsius and Alfred are unaware that it is now too late for Sarah, who awakens in mid-flight as a vampire and bites Alfred, thus allowing vampires to be released into the world. Roman Polanski talks about production difficulties in his autobiography: "Our first month's outdoor filming became a series of ingenious improvisations, mainly because the last-minute switch from one location (Austria) to another (Urtijëi, an Italian ski resort in the Dolomites) had left us so little time to revise our shooting schedules. The fact that we were filming in Italy entailed the employment of a certain number of Italian technicians and that, in turn bred some international friction. Gene Gutowski (the film's European producer) rightly suspected that the Italians were robbing us blind." Cinematographer Douglas Slocombe said: "I think he (Roman) put more of himself into Dance of the Vampires than into any other film. It brought to light the fairy-tale interest that he has. One was conscious all along when making the picture of a Central European background to the story. Very few of the crew could see anything in it - they thought it old-fashioned nonsense. But I could see this background....I have a French background myself and could sense the Central European atmosphere that surrounds it. The figure of Alfred is very much like Roman himself—a slight figure, young and a little defenseless—a touch of Kafka. It is very much a personal statement of his own humor as he used to chuckle all the way through the scenes." This film was the source material for the European stage musical Tanz der Vampire. It is peppered with numerous references to King Richard III of England, who even appears in the ball scene. When the film was first released in the United States, MGM wanted to market it as a "farce". MGM Head Editor Margaret Booth and Head of Theatrical Post Production Merle Chamberlain cut 12 minutes worth of material, and along with adding the animated prologue among other changes, the character of Professor Abronsius was re dubbed to give him a goofy, cartoony voice that would suit the "kooky" tone of the film. This version was slightly retitled as The Fearless Vampire Killers, or Pardon Me, But Your Teeth Are in My Neck. This was the version most commonly seen in the US until it vanished from circulation in the mid 70's. In the early 1980s, MGM unearthed a print of Roman Polanski's original cut and sent it to various repertory & revival houses for screenings. This version has garnered new interest and reevaluated opinions from critics and fans of Polanski's works, who have previously bashed the film in its mutilated US cut. Since then, the original version of the film is the one more commonly available today and has been released on VHS, Laserdisc, and DVD, and occasionally airs on TCM. The Fearless Vampire Killers was Polanski's first feature to be photographed in color using a widescreen 2.35:1 aspect ratio. The film is also notable in that it features Polanski's love of winter sports, particularly skiing. The sequence begins on a sunny day where a bird is minding his own business when the sun behind him sinks and the crescent moon rises in its place, starting night. The bird becomes alarmed and speeds away. Zooming out, the camera reveals the setting of a graveyard where Professor Abronsius and Alfred bump into each other. The two shake hands and a green vampire pops out from a grave behind them. After the successful scare, the vampire laughs as the camera zooms in on him. This procees is repeated twice. A bag falls from the sky; Abronsius reaches in and takes out a box containing garlic, which he and Alfred eat. They sneak up to the vampire (who has no idea where they are), tap his shoulder and breathe garlic breath on him, causing him to shrink and run off. The bag drops to them again and Alfred brings out a gold crucifix and gives it to Abronsius. They sneak up on the now plugged-nose vampire, show him the crucifix, and again he shrinks and run off. He hides behind the tree and tries to scare them again, but the sun replaces the moon, signaling the vampire to run, and Abronsius and Alfred chase him to a coffin. The bag appears one last time and Abronsius takes out a mallet and a wooden stake. With Alfred's help he kills the vampire, then places the lid on the coffin. In the pitch-black backdrop Professor Abronsius and Alfred congratulate each other until the MGM logo appears, startling them. The lion in the logo roars as its fangs grow longer. Frightened, Abronsius and Alfred run away, and blood drips out of the lion's mouth. The comedy mask disappears and the MGM lion turns into a cartoon vampire with blood dripping from its mouth in the logo. The score was provided by Krzysztof Komeda, who also scored Rosemary's Baby. 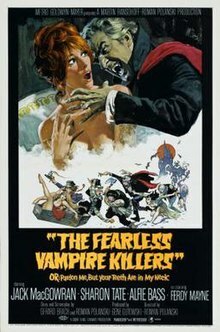 The Fearless Vampire Killers was released to DVD by Warner Home Video on September 13, 2005 as a Region 1 widescreen DVD, and later in other territories. This version of the film is Roman Polanski's original cut bearing "The Fearless Vampire Killers" title card. There is a region free Brazilian DVD by Cinemagia that, while using a dated 4:3 letterbox master of the original cut, has the US prologue as an extra. Outside of 16 or 35mm prints, no known official releases of the reedited US cut exist. The film, using the same version as the 2005 DVD, was released by Warner Home Video in France on December 20, 2013. Unlike most Warner Blu-ray releases, this one is locked to Region B territories and does not display on 60 Hz only equipment due to 1080i 50 Hz PAL encoding for all content. As of July 2017, it is unknown if Warner has plans for a proper 1080p Blu-ray release in the US or other territories. Hallenbeck, Bruce G. (2009). Comedy-Horror Films: A Chronological History, 1914–2008. Jefferson, North Carolina: McFarland & Company. ISBN 978-0-7864-3332-2.